I’ve never been an avid biker. Don’t get me wrong, I like biking just fine. I rode bike all around my small town when I was young. I even used my bike a bit in college. When I moved to the Uptown area, my bike resided at my parent’s home. Finally, my trusty Trek of fifteen years found its way back to me when I became a home owner. Still it lay dormant. Two children on the scene demanded way too much attention to get in a two-hour bike ride. I could have attached the Burley and pedaled away, but as a runner the most appealing and efficient plan for me was to push the Burley. When it became laughable and nearly impossible, I let my 4 and 6 year olds off the hook. No more Burley. I eyed my bike again when they were 5 and 7. I bought myself a new bike and Craigslisted to find a tandem for my old bike so my husband could ride with the five-year old. Ironically, my old black bike (purchased new in ’87) and our newly acquired tandem bore the same sticker from Okoboji Bikes, a bike shop in Okoboji, IA. We rode very few times that summer. The next summer, when they were 6 and 8, we turned the page. The kids could ride bike while I ran. The pacing was good, but three miles was about all my youngest could take. To avoid vehicle traffic, I would load up the bikes on the carrier and head to the uninterrupted paths around the lakes. I cursed this carrier, because bikes could be difficult to strap in – truthfully, it hindered my enthusiasm for family bike outings. Now, in the summer of 7 and 9, some of us in the family have renewed energy. I look back to May when my nine-year-old, Ava, decided she detested her bike, or rather the color: pink. 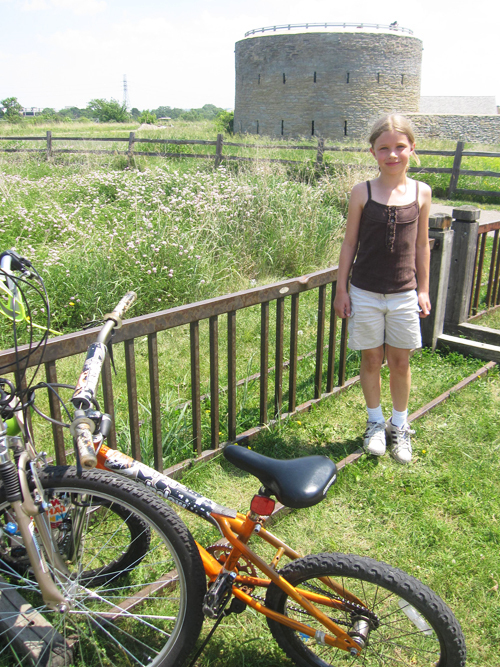 I could barely get her to ride it during Walk and Bike to School Week (May 2011 post). When she did, it was apparent that it was way too small. 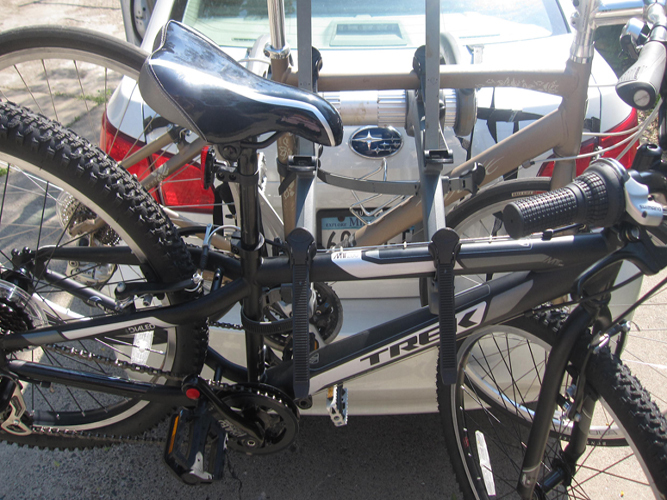 When her birthday came around, we upgraded at Freewheel Bike to a 24″ black Trek with a shiny black seat, seven gears and adjustable pedals to increase her range when she’s ready. We threw in a sleek silver helmet. The bike balance is now set again. Calvin moved from the bike he had outgrown and now prefers his hand-me down from the neighbor boy. As a result of the upgrades, we have two bikes to sell on Craigslist that are perfect for a 3-5 year-old boy and 5-7 year-old girl. The new balance allowed us to turn another page – I can now run while they bike. We can go from our house around the lake and back, which is about five miles. This is great, although I’m still not biking. I allowed myself to consider that Ava and I would go biking and not ask the boys to join us. Last weekend we tested this out (it helps that the boys have started golfing together). Ava loves to explore so I began with that premise. Could we get the bikes on the carrier rack and head to relatively carless path? 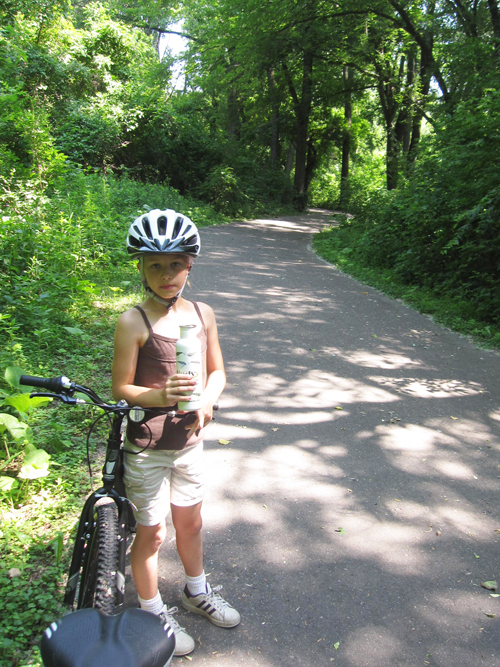 After looking at trail maps, we settled on the Big Rivers Regional Trail with a midpoint on our route that would connect across the river to Fort Snelling, one of her favorite places to wander. At age nine, our speed is more paired and I can get in a workout. We set out at 10:30a.m. and headed north. We crossed over a few roads and get a glimpse of the lengthy bridge we’d have to cross to head west to Fort Snelling. Ava was intimidated. I was a bit unsure too. We continued on for a while, then turned around to head back when the path abruptly ended. On the way back, Ava votes to bypass the bridge and head back to our car. In hindsight, a very wise decision. Had we crossed the bridge, our total route would have been 11 miles. About a mile out from the car, she needed a coach. There was whining before she pushed forward a few more times to finish our route. We had a picnic at the site overlooking the river, which improved our moods dramatically. I calculated our route as eight miles long (not the five I had anticipated). We got back to the car around 12:15. She would not let Fort Snelling go. We stopped off and wandered around the grounds to see how the bike trails connected for future reference. No doubt there is much to explore on bike in the Twin Cities area. We’re planning to seek out new bike routes at least once every weekend during the summer. I’m hopeful that trail accessibility, historic sites, restaurants, entertainment and parks along the way will keep us on Trek to reach our goal. The kids’ birthday’s have always been a big to-do in this household. We even extended it to my daughter’s American Girl doll – see Happy Birthday, Doll! This year was no exception. We put a tiny baby in the cake. We began the planning months in advance. We recapped previous parties – the Poodle in Paris Party for BD number 6 as well as Disco Party for number 8 – still remain tops. Why don’t we outsource the fun to Chucky Cheese or the Club Just Jump? I would say it is part fear (keeping an eye on 12 girls in a public place is frightening), part control and part obsession with a theme. Plus it’s practically the only party I throw every year. For number 9, we decided to go the Masquerade/ Mardi Gras Party route. True to form, our original concept was based on one item. This year it was the mask. I found them at Litin Paper for $3 each in green (for Ava only), blue and pink. A theme was born. From there it expanded to New Orleans cuisine, jello shots, parade floats, glittery make-up and beads. The party took place on a Friday night from 6-8p.m. 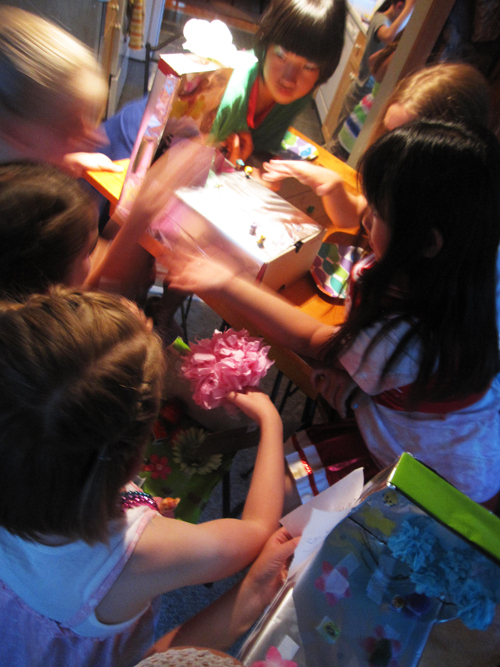 Once, when I was young, I hosted a 3-hr-long birthday party and learned my lesson. Let’s keep the guests, the birthday girl and Mom happy by ending it on a 2-hr upswing. 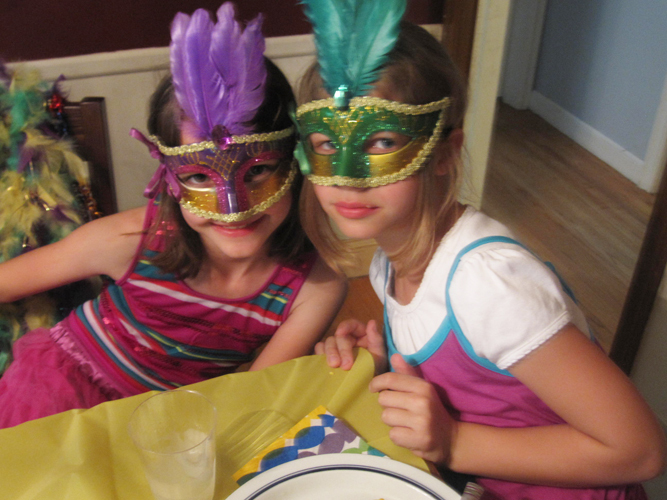 For these parties, the girls are always extremely prompt, which is another benefit to having it in the neighborhood. You hate to make parents suffer by traveling to a far-off party destination during Friday rush hour. Thankfully my Mother-In-Law agreed to come into town the night before and be my sous chef and party prep for the day. There is always so much work to be done. I shopped on Wednesday for hours. The Thursday prior, right after Ava’s track meet, we worked from 8-11p.m. cleaning, setting the table, cooking the Martha Red Rice Recipe, shucking the corn, chilling the jello (purple and lime), baking the King Cake, making name tags and cutting/gluing stuff for party crafts. I phoned in instructions during the day. I wasn’t going to be home until 5:15, which was a bit unnerving. I remained super focused on 8:15 and tried to relax, remembering from years past that friends just have fun hanging out together. Although, you really do NOT want to throw what any girl terms a boring party. 6:00p.m. Guests arrive. They immediately dig into the Mardi Gras parade float activity that’s comprised of a shoe box and some tin foil or wrapping paper for starters. The best part is that I spent an hour on Monday going though miscellaneous mismatched pieces of games and stuff to add to the doodads bin. Many of these discarded items of ours became the next finder’s treasure. Recycling! They happily hot gun glued them to their float that they would take with them at the party’s end. But for now, it was time to take a break. 6:20p.m. Dinner. 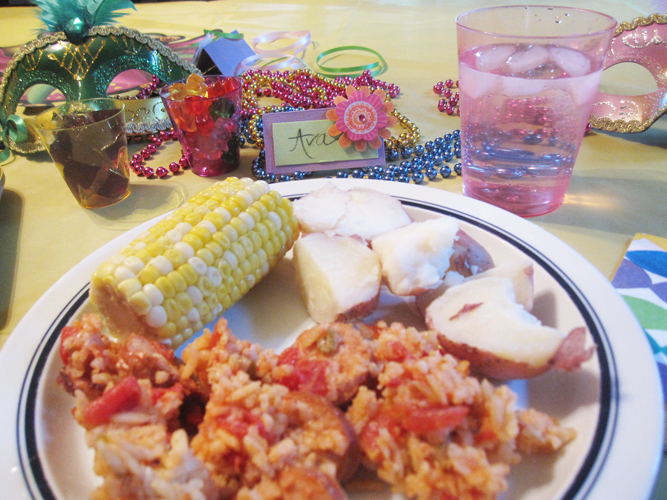 Sous Chef Sue, joined by Sister-In-Law, Katie, and I teamed up to serve the Red Rice, Sweet Corn and Baby Reds. The rice dish was the more adventurous-than-pizza attempt, but all of them graciously tried it while most finished it – even with garlic, onions, celery and tomatoes in the mix. It was also had sautéed chicken sausage to give it a kick. It was a small taste of New Orleans at any rate. 6:40p.m. Activities. this is when a variety of activity options come in handy. Everyone flocked to the hair and make-up station just opened by Katie for all their eyeshadow glitter and hair weaving needs. Ava immediately and diplomatically formed a list for the line-up so the girls could play or continue to work on their floats until their name was called. I remained on hot glue gun duty, but slinked away to change the vibe from the mood-setting “Buckwheat Storms New Orleans” to actual danceable tunes. 7:00p.m. dance party/ floatation devices. This is party mid-point so I let them free-fall awhile so we can clear dinner dishes. 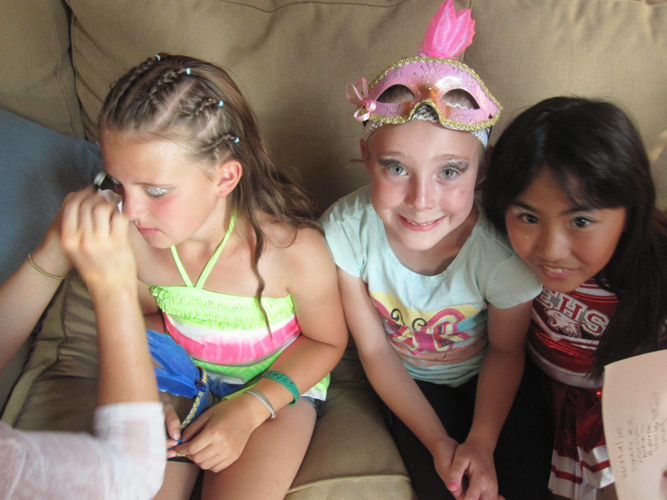 Half of the girls create a conga line, half remain fixed on their floats, and a few are in line, mesmerized by make-up. 7:20 p.m. We reconvene at the table with some slice of an unknown treat in front of us. This is not the 3 layer cake I painstakingly bake and decorate each year. It’s a King Cake. According to Mardi Gras tradition you throw a little plastic 1 inch baby toy in the cake and bake it. Whomever receives it has to throw the next Mardi Gras Party the following year. I edited a bit. When everyone was seated at the table, I threw a bit of a researched history into the mix about Mardi Gras colors and what they signify: purple (justice), gold (power) and green (faith). There were jello shots and gummi bears. And only when I had their full attention, I declared in hushed tones that whomever bit into this cake’s particular baby would have good luck for a year. One dear child said, even if I do get the baby, that’ll never happen. I know how she feels. Turns out Malaya finds that baby. She’s overjoyed and optimistic. I do hope luck is on her side this year. 7:45p.m. The float parade and judging. This aspect of the craft just sort of evolved. I had no idea if the girls would even take to it, but we had enough fun paper, ribbons and random doodads to keep them intrigued I guess. I just thought they would take or leave them, but the concept of parading them to a juror was agreed upon. Ava, who had started a float before the party but never finished, along with three other girls who really weren’t interested in doing their own, were the judges. Based on how I directed the construction of the craft earlier, they all had a theme for their float. Ava and her fellow judges gave fascinating positive critiques. In the end, of the 8 completed, they awarded 1-4 prizes. 8:00p.m. Parents promptly arrive. We choose to do a gifts-acceptable party this year, which for whatever reason seems to be the case every other year. I should have allowed another 15 minutes for this portion. It was really rushed, which was not the intention. Sure hope we can get all of the thank you cards straight! They took home their masks and floats. 8:07p.m. It’s over. Goodbyes have been said, hugs exchanged, doodads moved out on floats for good. Ava seems pleased and content. As am I. Until next year anyway. I’ll need to plan the party of the decade.